For breaking news from Portland Bureau of Transportation see our Twitter feed: @PBOTinfo. (April 18, 2019) - The Portland Bureau of Transportation (PBOT) and presenting sponsor Kaiser Permanente are proud to announce another season of Sunday Parkways, Portland’s premiere family-friendly walking and biking event. 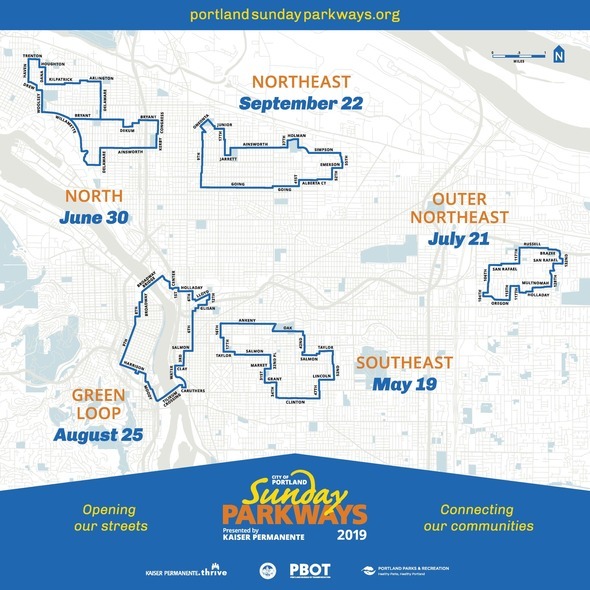 As in past years, Sunday Parkways 2019 will include five traffic-free events highlighting five different Portland neighborhoods from May through September. This year’s routes are classics with a twist, with new walking options at three different events for people who want to explore new neighborhoods and experience the fun of Sunday Parkways on foot. Outer Northeast Portland, July 21, 11a.m. to 4 p.m. (4.8 miles) – walking! Green Loop (Downtown/Central Eastside Portland), Aug. 25, 11 a.m. to 4 p.m. (7 miles) – walking! Northeast Portland, September 22, 11 a.m. to 4 p.m. (7.6 miles) – walking! The walking series includes the return of the Walk with Refugees and Immigrants in Outer Northeast on July 21, which will showcase new Portlander-led and co-developed musical and performance acts at both the start and end of the walk. In August, Sunday Parkways returns to the Green Loop. This route, which drew the largest number of participants in Sunday Parkways history in 2018, is not to be missed! The bike route will take riders on a tour of Portland’s Central City - over the Broadway Bridge, through the Rose Quarter, down SE Water Avenue and back over Tilikum Crossing. A series of walks, held in collaboration with staff and speakers from the Association of Pedestrian & Bicycle Professionals Conference, will highlight iconic places in the Central City such as the Portland Open Space Sequence. In September, Sunday Parkways will include the Ainsworth Walking Boulevard in partnership with Oregon Walks in Northeast Portland. “Congratulations to Portland Sunday Parkways on its 12th season! Sunday Parkways connects communities, and fosters the healthy, active use of our public streets for people of all backgrounds and abilities,” said Transportation Commissioner Chloe Eudaly. “Last year more than 125,000 people experienced their streets in a new way at a Sunday Parkways event, and I hope to see even more Portlanders walk, bike, and roll together in 2019." Sunday Parkways is currently looking for vendors, community partners, entertainers and volunteers who want to make Sunday Parkways happen. If interested, please contact Sunday Parkways at 503-823-7599, PortlandSundayParkways@portlandoregon.gov or check out the website at PortlandSundayParkways.org. The Portland Bureau of Transportation is the organizer of Sunday Parkways, working with our presenting sponsor for the last twelve years, Kaiser Permanente, as well as returning sponsors Portland Parks & Recreation, Metro, Bureau of Planning & Sustainability, Clif Bar, NW Natural, AAA Oregon/Idaho, AARP of Oregon, HDR Inc., Bureau of Environmental Services, New Seasons, Portland Fire and Rescue, Halprin Landscape Conservancy, iQ Credit Union, Portland Art Museum, Travel Portland, Parking Kitty, Portland Rose Quarter, Portland State University, and Bureau of Emergency Management. In 2019, PBOT is excited to welcome Linfield College as a new partner. PBOT and other public funds cover a third of the program costs, and two-thirds of funding comes from sponsors, vendors and individual supporters. Sunday Parkways is a series of free community events opening the city's largest public space—its streets—for people to walk, bike, roll and discover active transportation. The events are beloved by Portlanders of all ages. Annual attendance averages over 125,000 participants for the five Sunday Parkways events. Residents and visitors say they come to enjoy the traffic-free streets connecting parks and schools filled with activities, music and vendors. It’s safe, family-friendly and a chance to meet neighbors. For more information, including route maps, visit PortlandSundayParkways.org or call 503-823-7599. 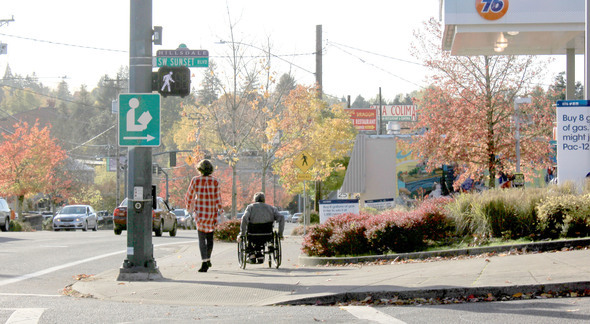 People walk along SW Capitol Highway in the Hillsdale neighborhood in Southwest Portland. Photo by Nick Falbo, Portland Bureau of Transportation. (April 17, 2019) The public review draft of Southwest in Motion (SWIM) is out! Like the Portland Bureau of Transportation’s (PBOT) other plans for active transportation, such as East Portland in Motion and Central City in Motion, SWIM is a realistic short-term action plan that identifies and prioritizes walking and biking projects for Southwest Portland. The public review draft of SWIM and an accompanying survey will be open for six weeks, through Friday, May 24. The SWIM plan was developed with extensive public feedback from Southwest Portlanders. 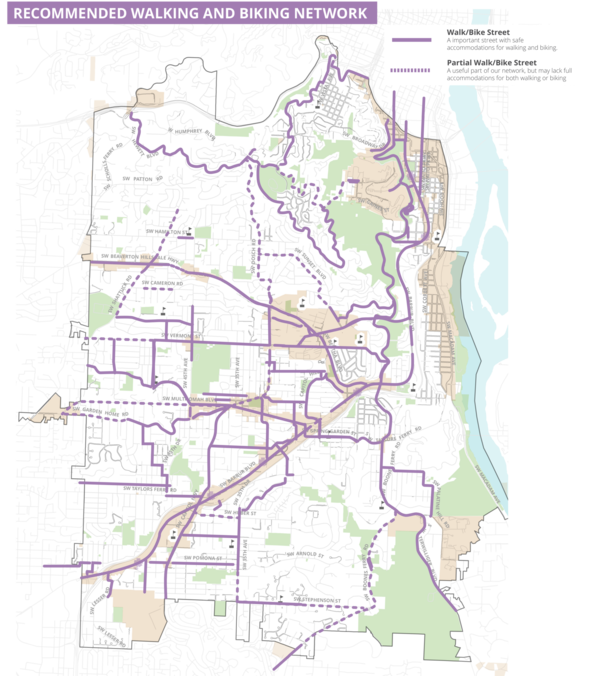 Over one thousand people used PBOT’s online mapping tool to provide their initial feedback on walking and biking priorities and needs in Southwest Portland. A stakeholder working group provided oversight and their knowledge of the neighborhood to help fine tune projects. 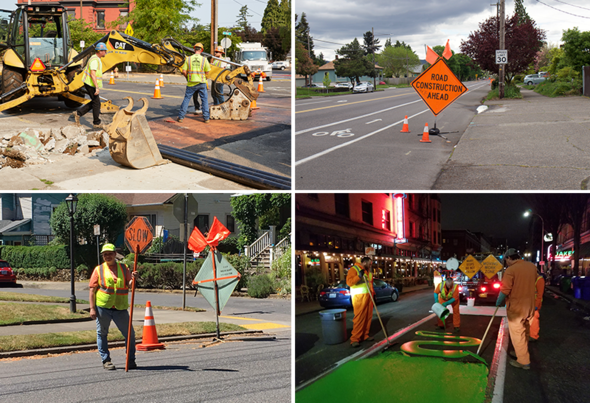 In addition, PBOT convened eight separate community focus groups to help staff identify infrastructure needs unique to specific communities. Participants included OHSU Campus Outreach, SW Trails, Markham Elementary Somali Families, Congregation Kesser Israel and others. The recommended walking and biking network for Southwest Portland that was developed as part of the Southwest in Motion planning process. Identifies priority short term walking and biking projects, such as bike lanes, sidewalks, shoulders, and neighborhood greenways. Lists short-term crossing enhancements, including enhanced and new crosswalk designs. Discusses other potential road safety enhancements, including walkable shoulders and traffic calming. Promotes key programs to support community-initiated projects, such as block parties, community plazas, and urban trails. Recommends policies to advance walking and biking in Southwest Portland. With continued population growth in Portland, Southwest Portlanders can play a major role making the City’s vision for a safe and sustainable transportation system a reality. In fact, today’s transportation trends suggest we are in the midst of a major transformation of how people get from place to place in Southwest Portland. Recent trends suggest that more and more people in Southwest Portland are choosing to get out of their cars and walk, bike, roll, or take transit instead. With the potential for major transportation investments on the horizon, what would it look like for Southwest Portland to be a place where every resident had a wide range of transportation options? By establishing a basic network for walking and biking, Southwest in Motion charts a course for a future Southwest Portland where residents have a range of safe and reliable transportation choices. Ready to dig in? View the public review draft of Southwest in Motion, check out specific project details and descriptions from Appendix A, then take a quick survey and tell us what you think. Your feedback will be used to help further refine the SWIM Plan before it is shared with City Council. The City Council date for the final draft plan is not yet set. Tilikum Crossing – Bridge of the People carries TriMet MAX train and buses, Portland Streetcar, and people walking, jogging, rolling, biking and scooting between Southeast Portland and South Waterfront. 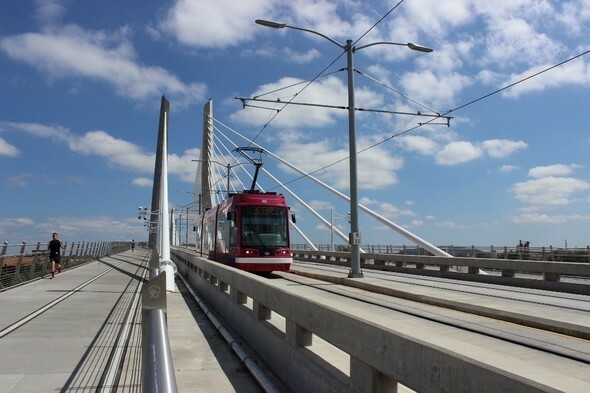 (April 11, 2019) The Portland Bureau of Transportation (PBOT) advises the traveling public that starting Monday, April 15, the pedestrian/bicycle path on the north side of Tilikum Crossing, Bridge of the People, will be closed for two weeks, followed by a two-week closure of the south side path. People walking and cycling in both directions on Tilikum Crossing will share the south side path between OMSI/SE Water and South Waterfront/SW Moody MAX stations April 15 through April 26, then share the north side path April 29 through May 10. These dates are subject to change. The closures will allow PBOT’s contractor Goodfellow Bros, Inc. to connect a new segment of SW Bond Avenue to Tilikum Crossing / SW Porter Street. Work will include demolishing and replacing concrete walkways and bikeways, handrails, electrical conduits, striping, signage and signal equipment. 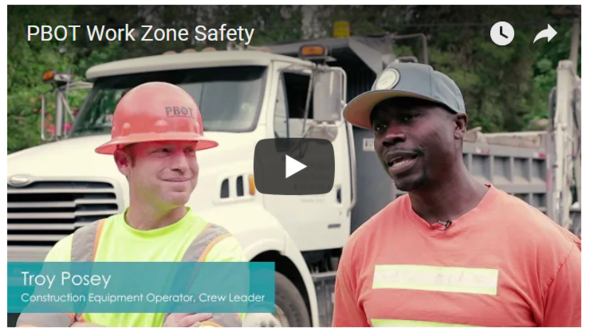 Periodic night work will allow TriMet and Portland Streetcar services to continue without disruption. We ask the public to travel cautiously, observe all construction signage, and use alternate routes if possible. Portions of this work are weather-dependent and the schedule may change. When SW Bond Avenue opens later this year, people will be able to walk, jog, roll, bike and scoot over the Tilikum Crossing from the east side, then make an immediate right turn onto SW Bond Avenue for a shorter route to downtown (or do the opposite route to access Tilikum eastbound). At the north end, SW Bond Avenue will connect to what used to be a cul-de-sac on SW River Parkway underneath the Marquam Bridge. SW Bond Avenue will feature sidewalks or interim asphalt walkways on both sides of the street, and a sidewalk-level protected bike lane in the northbound direction. Southbound bikes will share the roadway with light vehicle traffic in the southbound vehicle lane. Vehicular traffic will be able to use SW Bond Avenue in both directions between SW Meade Street and SW River Parkway, but will not be able to access SW Porter Street / Tilikum Crossing. Metered on-street parking will available north of SW Meade Street. The SW Bond Avenue Extension Phase 1 is a partnership between PBOT, Prosper Portland and Oregon Health and & Science University (OHSU). The city’s investment in this 1,500-foot-long street serves as the city’s contribution to the Knight Cancer Challenge – a public-private partnership launched by Phil and Penny Knight in 2013 to construct a state-of-the-art OHSU research institute focused on early cancer detection and treatment. The OHSU Knight Cancer Institute opened in 2018 at 2720 SW Moody Ave. and will see improved access upon the completion of SW Bond Avenue and SW Meade Street later this year. SW Bond Avenue also will provide access to six additional development sites on OHSU’s Schnitzer Campus. 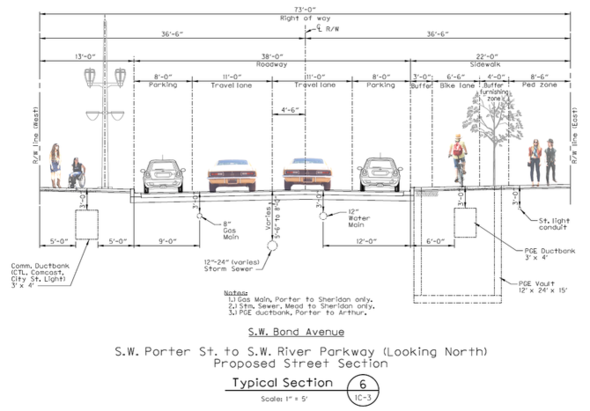 Substantial completion of SW Bond Avenue is anticipated in July 2019; however, PBOT’s ability to open the street to the public will depend on a number of technical issues associated with the connection to SW Meade Street, including lighting conduits and general construction activity. We will report an anticipated opening date when it is available. The SW Bond Avenue Extension is funded by the North Macadam Urban Renewal Area administered by Prosper Portland, transportation system development charges administered by PBOT, and an Immediate Opportunity Fund grant from the State of Oregon, with right-of-way donation and most environmental remediation work provided by OHSU.